On June 16, the Council of Churches of Cuba  issued the following statement regarding President Trump’s just announced changes in U.S. policies with respect to Cuba. 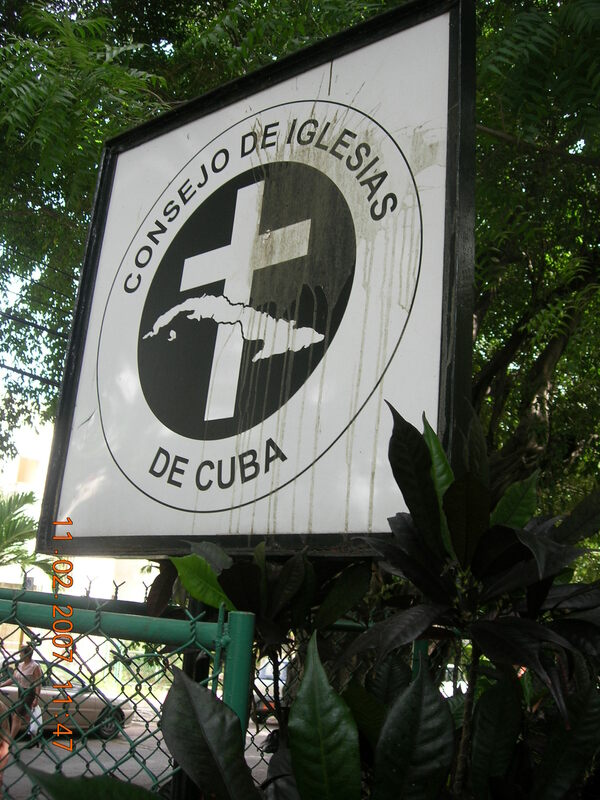 “Since its foundation in 1941, the Council has proclaimed unity for the service of our people and nation, through the search for love, justice and peace among all peoples and nations, which are the most evident evangelical signs of the reign of God among us.” Today “the Council is the lead institution of the Cuban ecumenical movement, composed of 51 churches and Christian institutions—Protestants, Reformed, Evangelical, Pentecostal, Episcopal and Orthodox—as well as Jews, Yogas and centers of study, information, community service and theological seminaries.” The Council’s current president and the signatory for this statement is Rev. Joel Ortega Dopico of the Presbyterian-Reformed Church of Cuba. The English translation of the original Spanish of the statement is provided by Jack Kern, an Elder at Covenant Presbyterian Church of Austin, Texas, which has a partnership with the Presbyterian Reformed Church of Cuba in the Luyanó neighborhood of Havana; he has made 24 trips to Cuba starting in 1998 and plans to return later this year. Does President Obama Have Legal Authority To Adopt More LImitations on the Scope of U.S. Embargo of Cuba? Granma, the official newspaper of the Communist Party of Cuba, reviews the measures already adopted by the Obama Administration to reduce the scope of the U.S. embargo of Cuba. The newspaper then asserts that the Administration has existing legal authority to adopt additional limitations of the embargo and isolates what only Congress can do to eliminate the embargo. The 12 categories of U.S. citizens permitted to travel to Cuba can do so now under a general license. Travelers are no longer subject to spending limits on the island and can use their credit and debit cards. Approved travelers may be accompanied by their families. In the area of telecommunications, exports of goods and services to Cuba are authorized. The main limitation is the requirement to pay cash in advance. The list of U.S. products that can be exported to Cuba without having to request authorization from the U.S. Department of Commerce is reduced to telecommunications products and services, construction materials and equipment and tools for the use of the non-state sector, including agriculture. The authorization to import Cuban goods and services produced by the non-state sector – which excludes key items for the Cuban economy such as tobacco. The modifications to the regulations on maritime transport, which allow for cargo ships carrying humanitarian goods to Cuba to enter U.S. ports before the 180 day limit applied to others – irrelevant since in practice the majority are not limited to transporting food, medicines, medical equipment or other authorized exports. Changes in the financial sphere merely facilitate processing of authorized transactions relating to travel, exports and remittances. The sale to Cuba of products by other countries containing up to 25% U.S. made components is permitted – the previous limit was 10%. The establishment of offices in Cuba by companies approved to have relations with the island was authorized. Authorize the use of the U.S. dollar in Cuba’s international transactions. Permit Cuban entities (banks, companies, etc.) to open corresponding accounts with U.S. banks. End the policy of financial persecution against Cuba, which has included the imposition of fines and sanctions. Allow the granting of credits, loans and finance to Cuba, in order to purchase products from the U.S. market (excluding agricultural products, prohibited by law). Authorize U.S. products to be directly exported to Cuba. Allow Cuba to import products from third countries which contain over 25% U.S. made components. Allow the U.S. to import Cuban products and services which constitute exportable goods key to the Cuban economy, such as tobacco, rum and biotechnology products, including products manufactured in third countries which contain Cuban raw materials such as nickel or sugar. Allow U.S. companies to invest in Cuba. Eliminate the value limit on Cuban goods that U.S. travelers can import from Cuba, for personal use or as gifts. Allow U.S. citizens to receive medical treatment in Cuba. Instruct U.S. representatives in international financial institutions not to impede the granting of credits or other financial services to Cuba. Eliminating the blockade (Helms-Burton Act) in its entirety. Cuba, of course, is urging the Obama Administration to adopt the 11 previously mentioned measures that Cuba asserts are legally permissible under U.S. law and the Congress to adopt the above five measures. Although I am a retired lawyer, I have not attempted to determine whether Cuba is correct in its contention that the Administration has the legal authority to adopt the above 11 limitations. I invite an attorney knowledgeable about such matters to share an analysis of these issues. If there is such legal authority, I would join in a request that these measures be adopted as this blog consistently has called for ending the embargo. U.S. blockade remains in effect, Granma (Jan. 14, 2016). Posted on January 14, 2016 Categories History, Law, Other countries, PoliticsTags Cuba, Granma, Helms-Burton Act, Obama Administration, President Barack Obama, Torricelli Act, U.S. Congress, U.S. embargo (blockade) of Cuba, U.S. Trade Sanctions Reform and Export Enhancement Act of 2000, United States of America (USA)Leave a comment on Does President Obama Have Legal Authority To Adopt More LImitations on the Scope of U.S. Embargo of Cuba?